Owl is the common name for any of the birds of prey comprising the order Strigiformes, characterized by large, round, frontset eyes surrounded by a circular or heart-shaped disk of radiating feathers, sharply hooked beaks, feathered and hooked talons, ears that can be closed, a relatively large head, and often a soft and fluffy plumage with serrated edges that allows for flight that is almost noiseless. Most are solitary, and nocturnal, with some exceptions (for example, the burrowing owl). 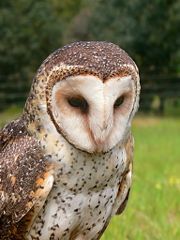 There are over 200 extant species divided into two families, the typical owls, Strigidae, and the barn-owls, Tytonidae. They are found in all regions of the Earth except Antarctica, most of Greenland, and some remote islands. Owls provide important ecological functions. As top predators, they help to control populations of small mammals (rodents, bats, shrews), insects, and other birds, and a few species specialize in hunting fish. 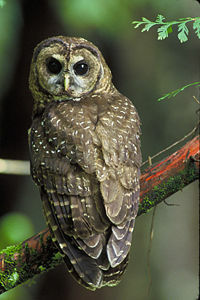 Generally, only the small owls are at risk, from such predators as foxes and snakes. For humans, owls have fascinated people for centuries, with references in Ancient Egypt, the Aztecs and Mayan civilizations, and other cultures of Africa, Asia, Europe, and the Americas. While in some cultures they are seen as symbols of death and destruction, their eyes surrounded by radiating feathers often gives the impression of intelligence, and thus they also are seen in some cultures as a symbol of wisdom. Owls have large forward-facing eyes and ear-holes, a hawk-like beak, a flat face, and usually a conspicuous circle of feathers around each eye called a facial disk. Although owls have binocular vision, their large eyes are fixed in their sockets, as with other birds, and they must turn their entire head to change views. They can turn their head 135 degrees in either direction; they can thus look behind their own shoulders. The smallest owl is the elf owl (Micrathene whitneyi) of North America, at as little as 31 grams (1.1 ounces) and 13.5 centimeters (5.3 inches). Some of the pygmy owls of the Old World are scarcely larger. Adult saw-whet owls (Aegolius acadicus) reach only about 18 centimeters (7.1 inches) long with a 43 centimeter (16.9 inches) wingspan. The largest owls are two of the eagle owls, the Eurasian eagle owl (Bubo bubo) and Blakiston's fish owl (Bubo blakistoni), which may reach a size of 60 to 71 centimeters (23.6 to 28 inches) long, have a wingspan of almost 2 meters (6.6 feet), and a weight of nearly 4.5 kilograms (10 pounds). Owls are far-sighted, and are unable to see anything clearly within a few inches of their eyes. Their far vision, particularly in low light, is exceptionally good. Different species of owls make different sounds; the wide range of calls aids owls in finding mates or announcing their presence to potential competitors, and also aids ornithologists and birders in locating these birds and recognizing species. The facial disc helps to funnel the sound of prey to their ears. In many species, these are placed asymmetrically, for better directional location (Cotty 2008). 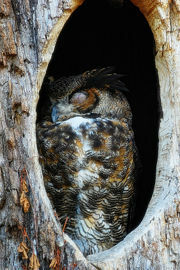 An owl sleeping at daytime in a hollow tree. Most owls are nocturnal, actively hunting for prey only under the cover of darkness. Several types of owl, however, are crepuscular, or active during the twilight hours of dawn and dusk; one example is the pygmy owl (Glaucidium). A few owls are also active during the day; examples are the burrowing owl (Speotyto cunicularia) and the short-eared owl (Asio flammeus). The serrations on the leading edge of an owl's flight feathers reduce noise. Much of the owl's hunting strategy depends on stealth and surprise. Owls have at least two adaptations that aid them in achieving stealth. First, the dull coloration of an owl's feathers can render them almost invisible under certain conditions. Secondly, serrated edges on the leading edge of the owl's remiges muffle the owl's wingbeats, allowing its flight to be practically silent. Some fish-eating owls, where this silence is of no hunting advantage, lack this adaptation. Elf owls and burrowing owls also lack the feathers for silent flying. Once prey has been captured, the owl's sharp beak and powerful talons, or clawed feet, allow it to kill its prey before swallowing it whole (unless it is too big). Scientists studying the diets of owls are helped by their habit of regurgitating the indigestible parts of their prey (such as bones, scales, and fur) in the form of pellets. These "owl pellets" are often sold by companies to schools to be dissected by students as a lesson in biology and ecology, because they are plentiful and easy to interpret. Owl eggs are usually white and almost spherical, and range in number from a few to a dozen, depending on species. The eggs are laid in intervals of 1 to 3 days and do not hatch at the same time. This accounts for the wide variation in the size of sibling nestlings. Owls do not construct nests but rather look for a sheltered nesting site or an abandoned nest, in trees, underground burrows, or in buildings, barns, and caves. A long-eared owl, Asio otus, in erect pose. Tytonidae gen. et sp. indet. "TMT 164" (Middle Miocene)—Prosybris? Owls have been a feature of falconry for years. (Falconry is the art or sport that involves the use of trained raptors, birds of prey, to hunt or pursue game for humans). In recent years, many owls have moved from their previous rural habitats to inhabit urban areas. The tawny owl has been a common visitor to cities across the United Kingdom for about forty years, where it survives on a diet of pigeons and small birds. Owls in urban areas are also known to prey on new-born kittens (Gettys 2004). In many parts of the world, owls have been associated with death and misfortune, likely due to their nocturnal activity and common screeching call. 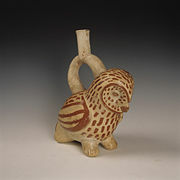 However, owls have also been associated with wisdom and prosperity, frequently being companion animals for goddesses. In Hindu Mythology, the barn owl is considered to be vehicle of Goddess Lakshmi (Goddess of Wealth) and, thus, it is considered lucky if an owl resides near one's house. Ancient Egyptians used a representation of an owl for their hieroglyph for the sound m. They would often draw this hieroglyph with its legs broken to keep this bird of prey from coming to life. Among the Kikuyu of Kenya it was believed that owls were harbingers of death. If one saw an owl or heard its hoot, someone was going to die. In general, owls are viewed as harbingers of bad luck, ill health, or death. The belief is widespread even today (Marcot 2006). Moche Owl. 200 C.E. Larco Museum Collection Lima, Peru. The Aztecs and Mayans, along with other natives of Mesoamerica, considered the owl a symbol of death and destruction. In fact, the Aztec god of death, Mictlantecuhtli, was often depicted with owls. There is an old saying in Mexico that is still in use (considered politically incorrect): Cuando el tecolote canta, el indio muere ("When the owl cries/sings, the Indian dies"). The Popol Vuh, a Mayan religious text, describes owls as messengers of Xibalba (the Mayan "Place of Fright") (Meta Religion 2007). In the culture of the Hopi nation, taboos surround owls and they are associated with evil or sorcery. In the United States, as with eagle feathers, the possession of owl feathers as religious objects is regulated by federal law (for example, The Migratory Bird Treaty Act of 1918 and Title 50 Part 22 Code of Federal Regulations). In Japanese culture, owls are seen as either negative or positive symbols depending on species. Sometimes owls are seen as divine messengers of the gods, while barn or horned owls are perceived as demonic figures. In Indian culture, a white owl is considered a companion and vahana (Vehicle of god/goddess) of Lakshmi, the goddess of wealth, and therefore a harbinger of prosperity. In colloquial use, however, it is commonly used to refer to stupidity. The Hindi word for owl, ulloo is used to refer to a foolish person. The demoness Lilith is thought to have been associated with (screech) owls as well, by way of the King James Version (KJV) translation of the passage in Isaiah 34:14. Prior to the rise of Islam, owls were considered bad omens and associated with evil spirits in most Middle Eastern pagan traditions. In modern times, although such superstitions are less prevalent, owls are still popularly considered "evil" because of their fierce, horrific appearance. In the Malay language, owls are called "burung hantu," literally "ghost bird." In Greek mythology, the owl, and specifically the little owl (Athene noctua), was often associated with the goddess Athena, a bird goddess who became associated with wisdom, the arts, and skills, and as a result, owls also became associated with wisdom. The Romans, in addition to having borrowed the Greek associations of the owl, also considered owls to be funerary birds, due to their nocturnal activity and often having their nests in inaccessible places. As a result, seeing an owl in the daytime was considered a bad omen. For example, in Book 12 of Virgil's Aeneid, an owl appears before Turnus toward the end of his battle with Aeneas, prefiguring his death, and "a strange, numbing dread / Washed through Turnus' body; his hair / Bristled with fear; his voice stuck in his throat" (Virgil 29-19 B.C.E., transl. 2005). The vampiric strix of Roman mythology was in part based on the owl. Likewise, in Romanian culture, the mournful call of an owl is thought to predict the death of somebody living in the neighborhood. Such superstitions caused a minor disturbance when an owl showed up at Romanian President's residence, Cotroceni Palace. In France, a difference is made between hiboux, eared owls, which are considered symbols of wisdom, and chouettes, earless owls (those without ear tufts, genus Strix), which are considered birds of ill omen. In the Welsh Cycles of the Mabinogion, the owl is considered cursed—the first owl was Blodeuedd, a woman born of flowers to be the wife of Lleu Llaw Gyffes. Because she fell in love with another man and plotted to kill Lleu, Lleu's guardian Gwydion turned her into the first owl, saying "You are never to show your face to the light of day, rather you shall fear other birds; they will be hostile to you, and it will be their nature to maul and molest you wherever they find you. You will not lose your name but always be called Blodeuwedd." The addition of the w in her name changed her from a woman of flowers to an owl. In Finland, the owl is paradoxically viewed as both a symbol of wisdom, and as a symbol of imbecility, presumably because of its "dumb stare." Calaprice, A., and B. Heinrich. 1990. Owl in the House: A Naturalist's Diary. Boston: Joy Street Books. ISBN 0316354562. Farner, D. S., J. R. King, and K. C. Parkes. 1993. Avian Biology. New York: Academic Press. ISBN 0122494091. Gettys, T. 2004. Owls culprits in cat deaths. Enquirer August 26, 2004. Haaramo, M. 2006. Caprimulgiformes: Nightjars. Mikko's Phylogeny Archive. Retrieved September 23, 2008. Heinrich, B. 1993. One Man's Owl. Princeton, NJ: Princeton University Press. ISBN 0691000654. Johnsgard, P. A. 2002. North American Owls: Biology and Natural History. Washington, DC: Smithsonian Institution Press. ISBN 1560989394. Marcot, B. G. 2006. Appendix 2: Owl tales from Africa. In B.G. Marcot, D. H. Johnson, and M. Cocker, Owls in Lore and Culture. The Owl Pages. Retrieved September 23, 2008. Mayr, G. 2005. "Old World phorusrhacids" (Aves, Phorusrhacidae): A new look at Strigogyps ("Aenigmavis") sapea (Peters 1987). PaleoBios 25(1): 11-16. Retrieved September 23, 2008. Meta Religion. 2007. The Popol Vuh. Meta-religion.com. Retrieved September 23, 2008. Mortimer, M. 2004. Cladogram: Theropoda. The Theropod Database. Retrieved September 23, 2008. Norberg, R. A. 1977. Occurrence and independent evolution of bilateral ear asymmetry in owls and implications on owl taxonomy. Philosophical Transactions of the Royal Society of London, Series B, Biological Sciences. 280: 375-408. Olson, S. L. 1985. The fossil record of birds. In D. S. Farner, J. R. King, and K. C. Parkes. (Eds.). Avian Biology, Volume 8. Orlando: Academic Press. ISBN 0122494083. Peters, D. S. 2007. The fossil family Ameghinornithidae (Mourer-Chauviré 1981): A short synopsis. Journal of Ornithology 148(1): 25-28. Retrieved September 23, 2008. Sánchez Marco, A. 2004. Avian zoogeographical patterns during the Quaternary in the Mediterranean region and paleoclimatic interpretation. Ardeola 51(1): 91-132. Retrieved September 23, 2008. Sibley, C. Gald, and B. L. Monroe. 1990. Distribution and Taxonomy of the Birds of the World: A Study in Molecular Evolution. New Haven, CT: Yale University Press. ISBN 0300049692. Virgil. Between 29 and 19 B.C.E. (Translation 2005 by Stanley Lombardo). Aeneid. Indianapolis: Hackett. 12.1047-49.